Please join us as we focus on learning about and trying one vegetable each week. Radish week is coming to a close. 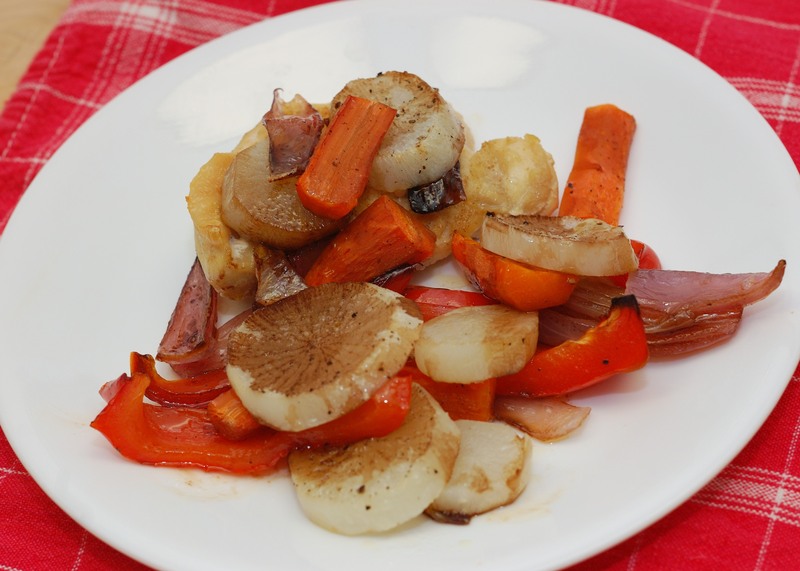 Our final recipe is Roasted Radish, Pepper and Carrot that we found at Sarah’s Cucina Bella. 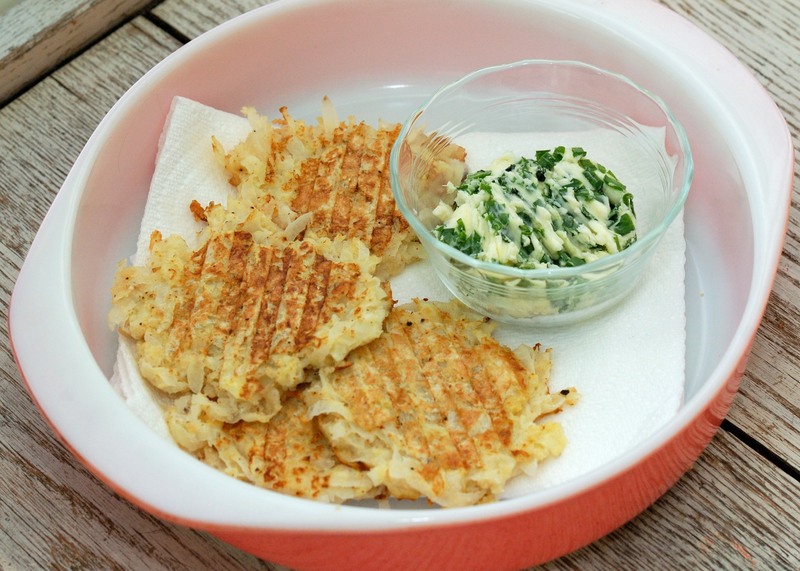 This recipe uses the daikon type of radish that we made into radish cakes a few days ago. I had high hopes for this recipe, since I liked the radish cakes and like all the other veggies in this recipe. The idea of roasting them sounded appealing, as well as the idea of adding balsamic vinegar. First we gathered our veggies. 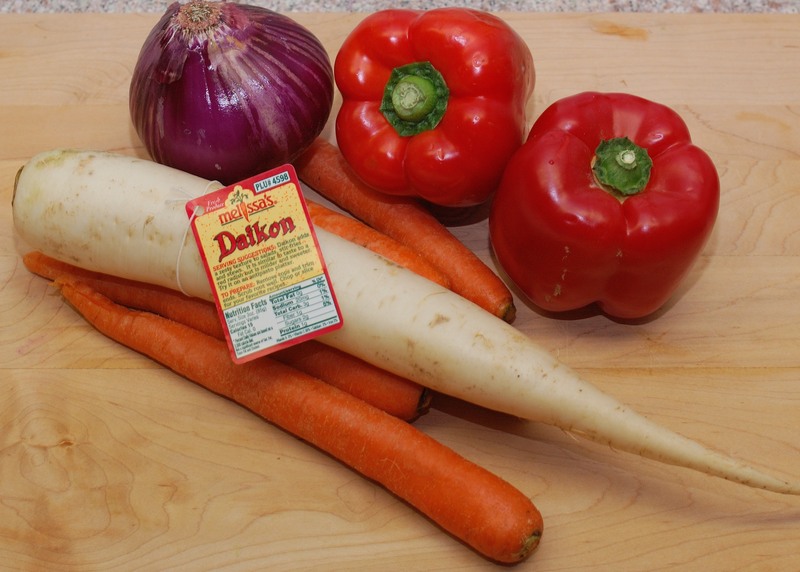 The recipe calls for specific amounts daikon radish, carrot, red bell pepper and shallot. We just chopped up what we had without measuring and used an onion instead of a shallot, because that is all we had. 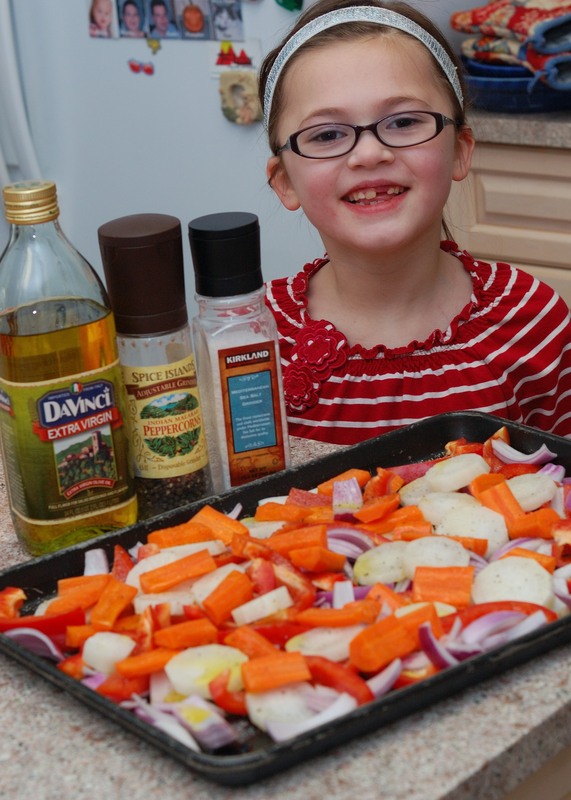 I think Lucie is too young to use a sharp knife, but she was still interested in learning about what I was doing and had fun stealing a few peppers and carrots to munch on while I cut the veggies for roasting. 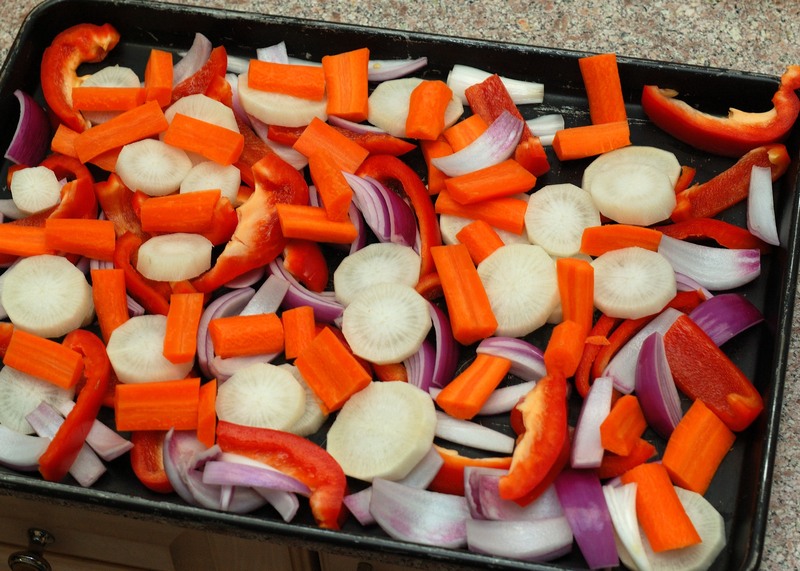 We drizzled the veggies with olive oil, added salt and pepper and put them in the oven at 400 degrees for 30 minutes. After 30 minutes, we drizzled them with a bit of balsamic vinegar and put them back in the oven for about ten more minutes. The veggies looked good and smelled good at this point. I could not wait to taste them and neither could Lucie and Dave. 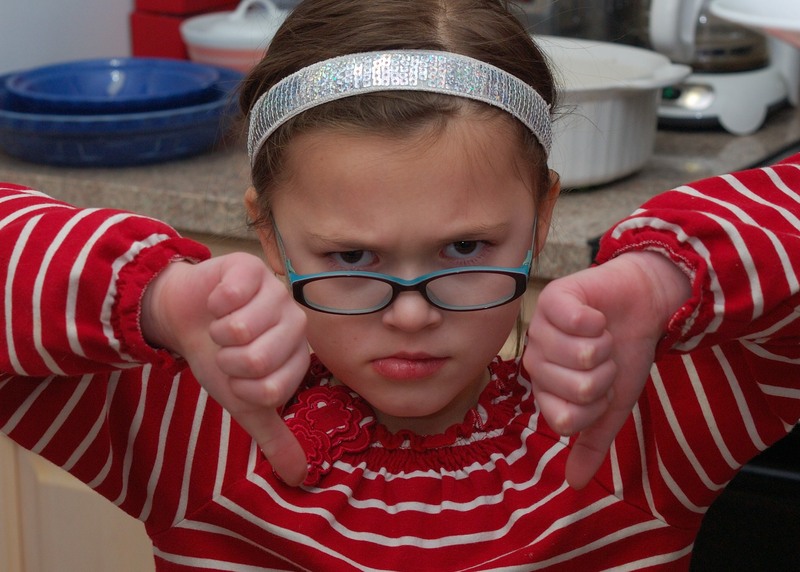 Two thumbs down! I had to agree with her. I thought the rest of the veggies tasted fine, but the radish was just not for me. I’m not quite sure how to describe it, but I really did not like it. Josie and Theo are smart kids. They watch Lucie very closely and they trust her judgement. They were not going near these radishes. 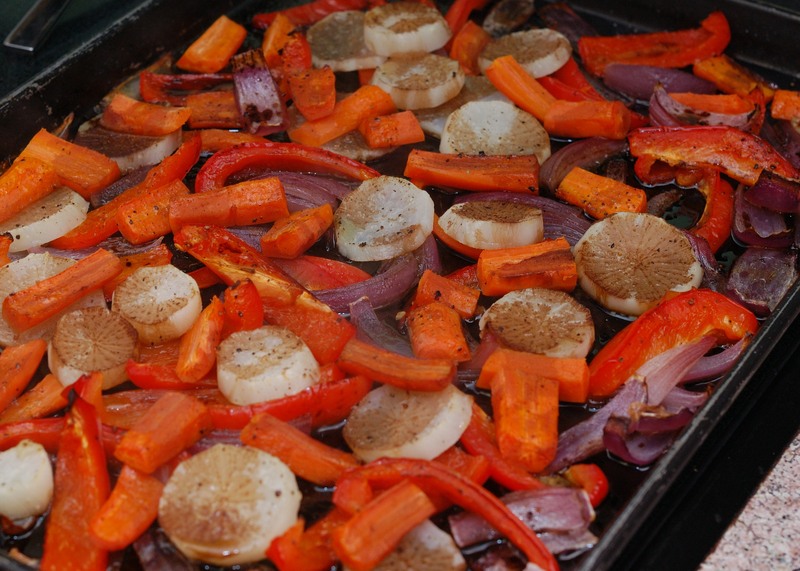 Dave, on the other hand, LOVED these roasted veggies, especially the roasted daikon radishes. He ate them with a baked chicken breast and had a second serving of veggies. He says he would gladly eat this dish again. Overall, I feel that we learned a lot during radish week. I had never even heard of a daikon radish before last Sunday and I ended up using them twice this week. I thought that learning about tillage radishes and the Night of the Radishes festival was interesting. 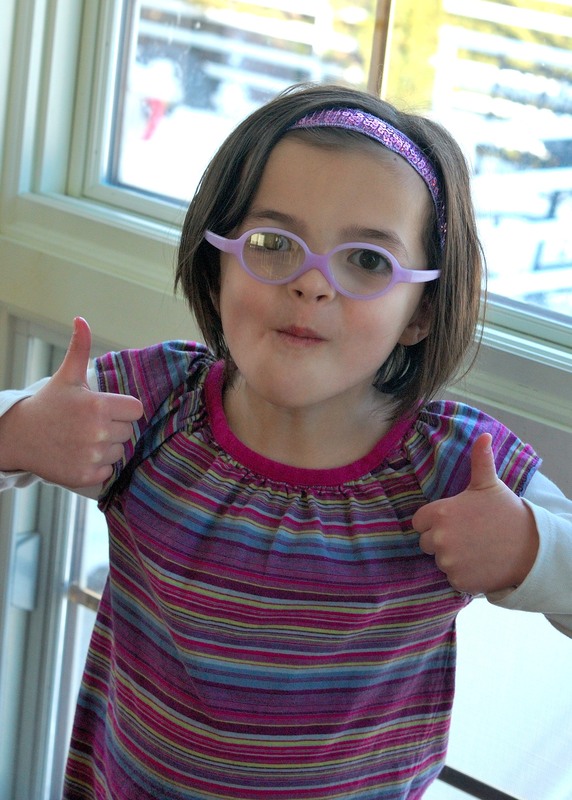 I was proud of how excited Lucie was about incorporating the veggies into a math lesson. 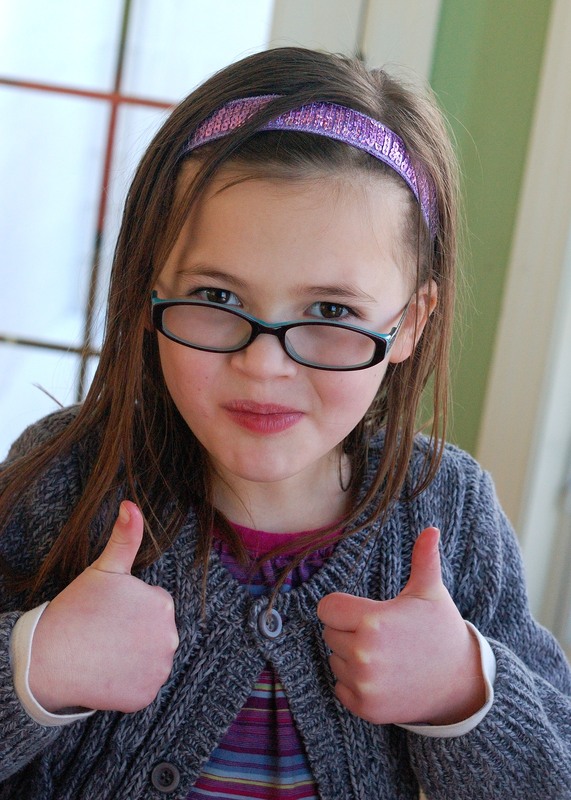 (Lucie’s radish calculations were Dave’s favorite part of our blog so far.) 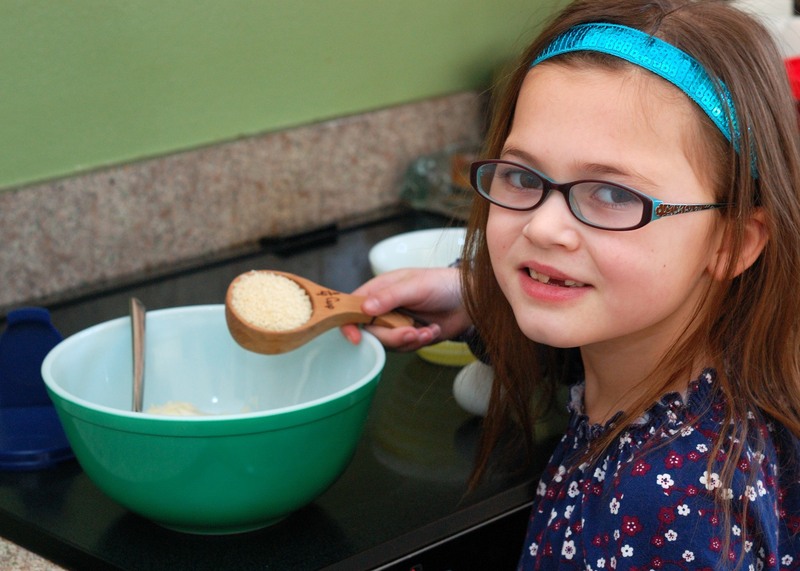 I also felt that the kids were very interested in what we were doing in the kitchen and enjoyed being involved in preparing and tasting our recipes. What was your favorite part of radish week? We would love to hear from you! 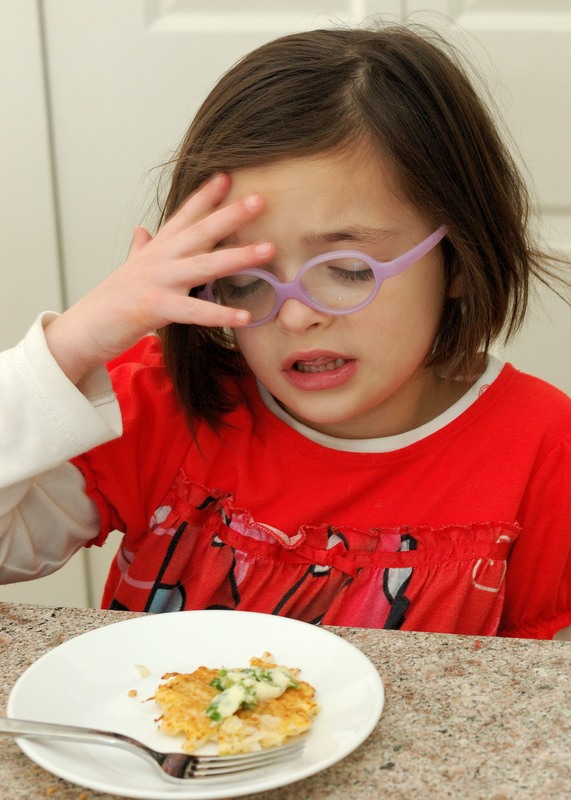 We tried a cooked daikon radish recipe. I thought it looked like a veggie salad before we put it in the oven. 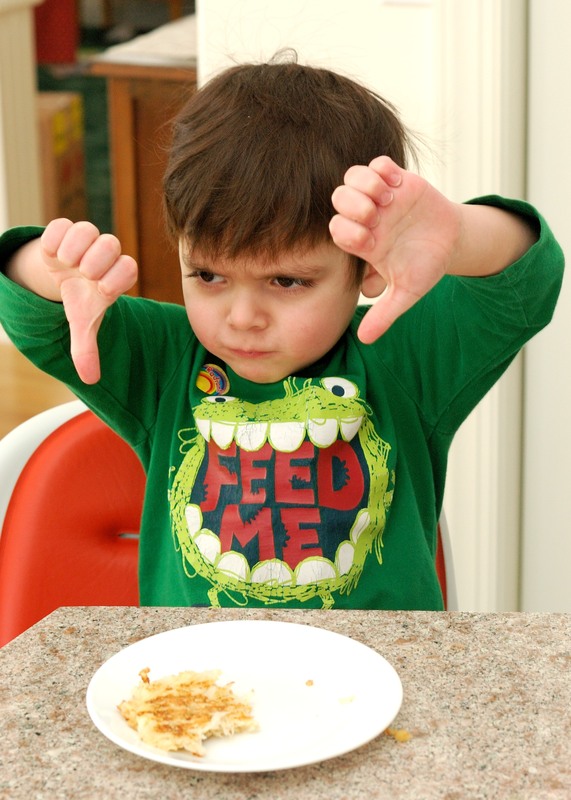 I gave it two thumbs down. I did not like it. I really liked radish week because I like the spicy taste of radishes. In fact, I just ate a bowl of crunchy, red radishes with salt and butter. Categories: Radish | Tags: carrot, daikon radish, radish, red pepper | Permalink. While Lucie and I were researching radishes online, we came across an article about a festival in Oaxaca, Mexico called “The Night of Radishes”. This festival is held each year on December 23 and features art carved from locally grown radishes. You can read more about it in this article from the Vancouver Observer. Lucie and I decided to try our own radish art. We saw this idea at Shades of Tangerine. 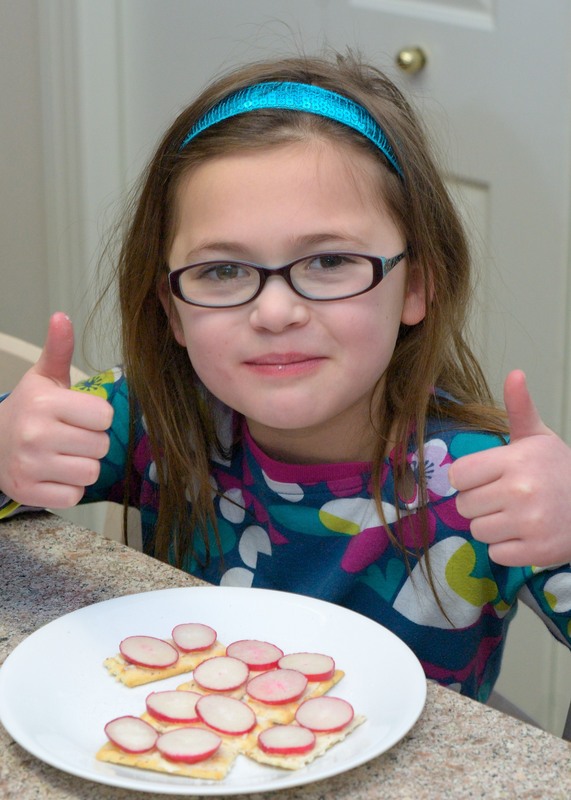 In addition to making radish art, we tried making two different kinds of radish chips. The first was plain baked radish chips with salt. We found this recipe on food.com. 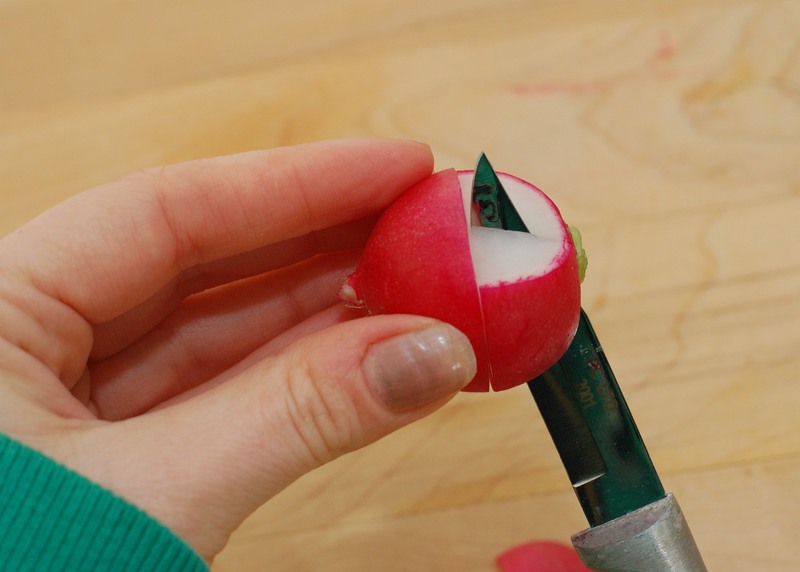 First we sliced the radishes. We just used a knife, but they may have been a more consistent thickness if we had used some kind of vegetable slicing device. Next, we added one tablespoon of peanut oil and tossed the slices around to coat them. I’m sure any other kind of oil would be fine. 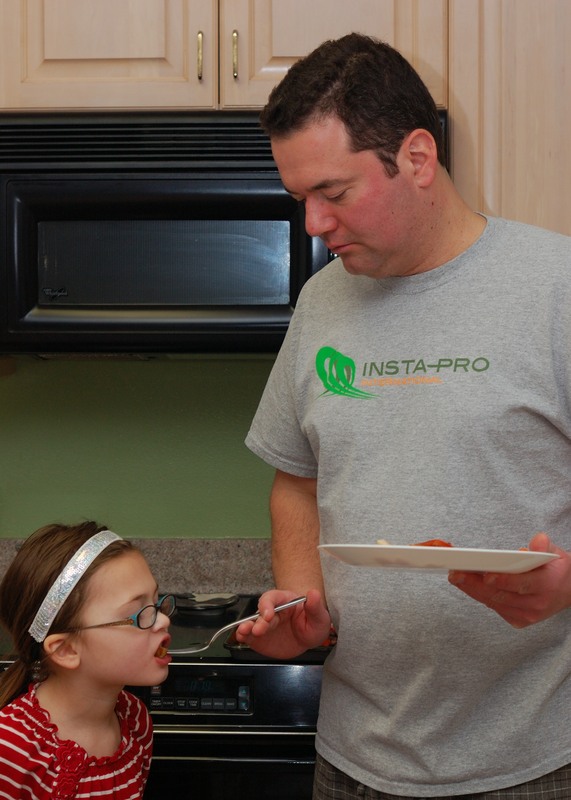 The girls were excited to help with the next step and had fun lining them up on the baking sheet. We sprinked them with salt and baked them at 375 degrees for about 8 minutes. Then we flipped each little radish slice over and baked them for another 8 minutes. We may have overcooked them, but we found that we liked the crispy ones the best. These were eaten in less than one and a half minutes. And they only took about 30 minutes of slicing, arranging, flipping and salting to make. We need to find a way to automate this process. She was smiling as she tasted a radish! 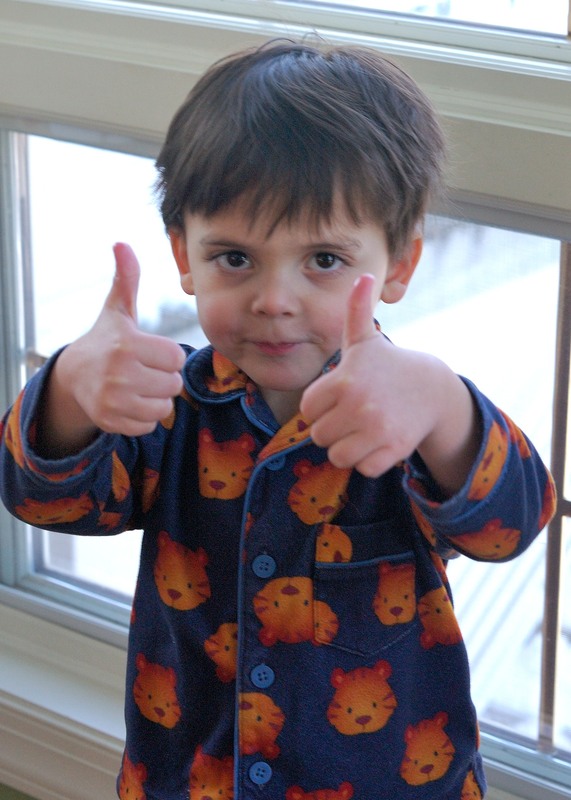 We got a triple two thumbs up rating for this one! We will definitely be making baked radish chips again soon. We also tried a cinnamon, sugar and honey variety of baked radish ships from Pinch of Yum. This variation was a little trickier to bake. They went from soggy to overdone in the blink of an eye. The girls did not like this kind of radish chips, but Theo and I gobbled them up. I thought they tasted kind of like really burnt marshmallow for s’mores, which I love, but I would probably skip this variety in the future. 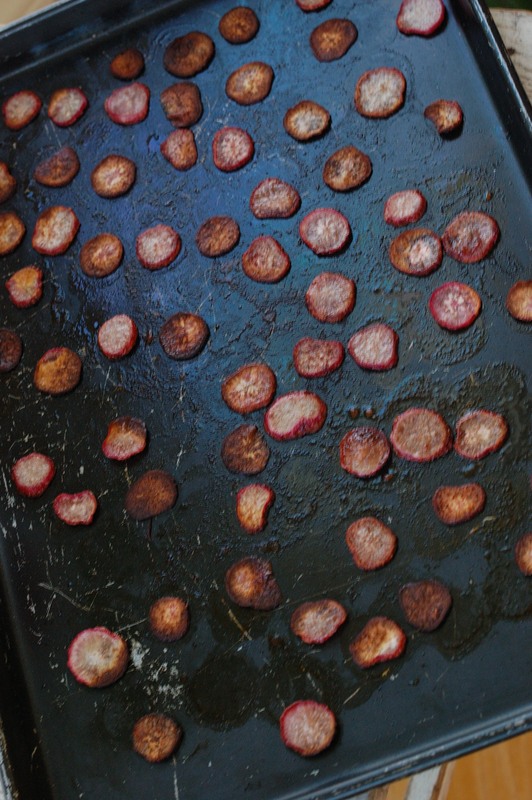 We made radish chips and they were a lot of work. Josie and I helped Mama lay the radishes out on the tray. I like one kind of radish chips, but I did not like the other. I think the radish festival and carving contest in Mexico is cool. I would like to visit the radish festival someday. 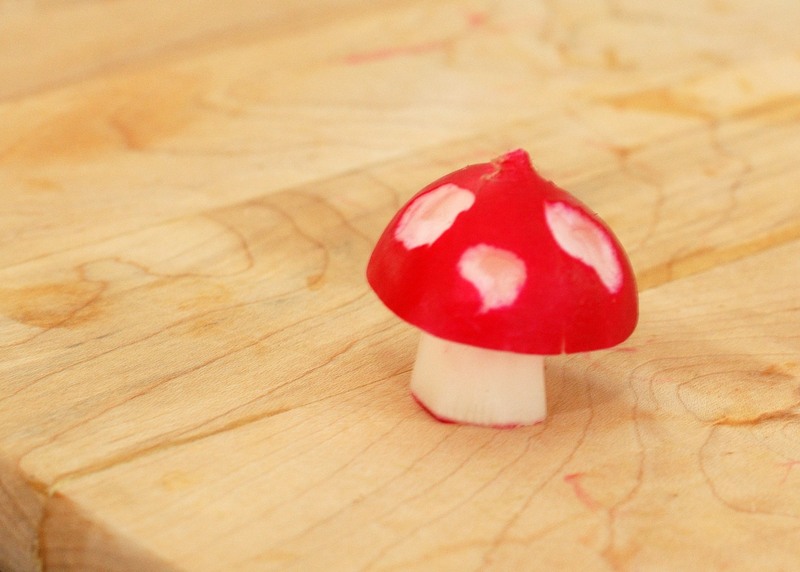 I like the mushroom radish that we made. Vegetables can be more than tasty. They can also be fun! Categories: Radish, Veggie Fun | Tags: chips, radish, vegetable art | Permalink. 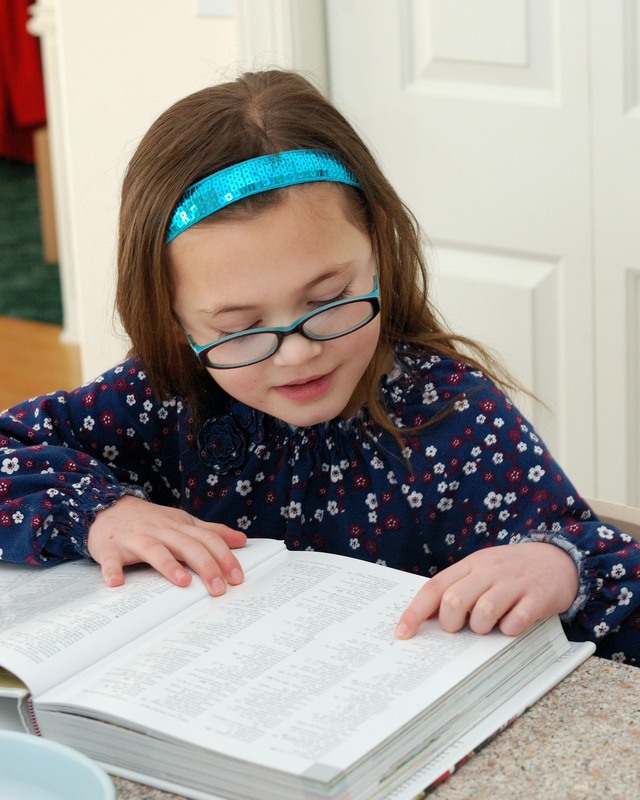 This year, Lucie has been attending a virtual school from home. We feel very fortunate that K12.com is a public school option in our state. One of the things we love about it is that we have time to come up with our own learning projects to supplement the already comprehensive curriculum that K12.com provides. 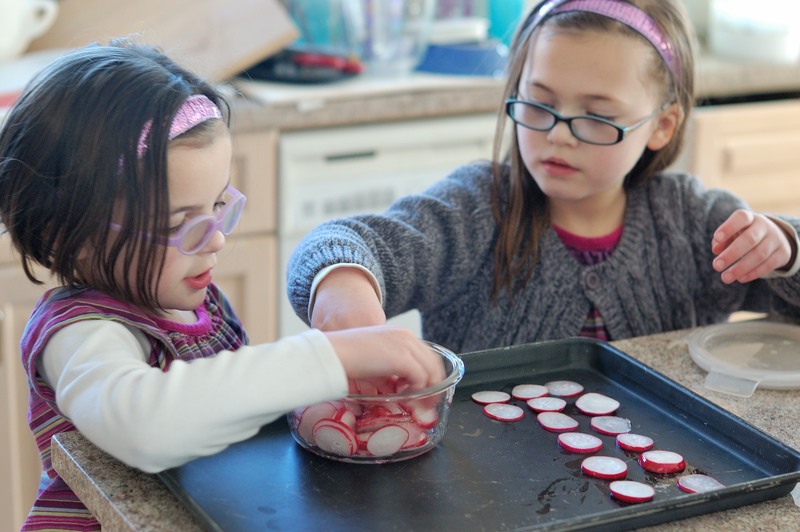 This blog is one of our projects and today’s radish project was a way of incorporating math and consumer education into our vegetables. When we shopped for radishes on Sunday, we wanted to compare the price and quality of radishes available. We shopped for radishes at Whole Foods and Hy-Vee. 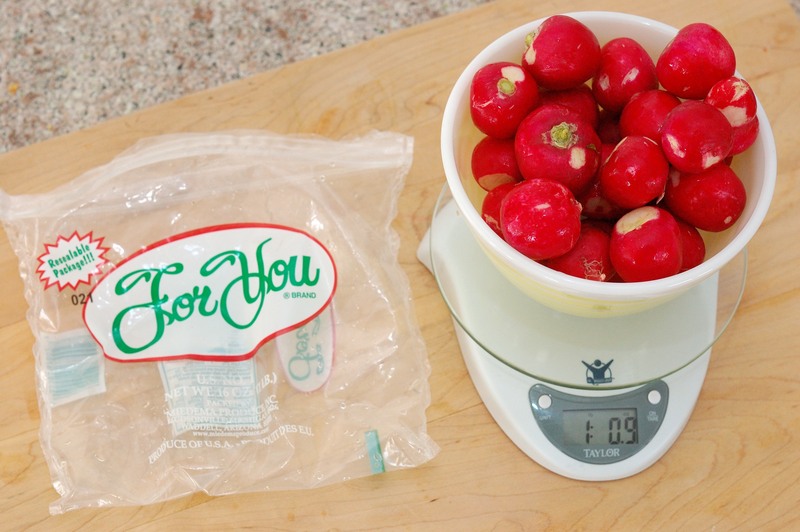 We decided to measure how much radishes cost per ounce and whether the quality varied based on the price. We purchased the two bunches of radishes on the left from Whole Foods. These cost $2.00 per bunch and were labeled as “organic”. We purchased the two bunches on the right from Hy-Vee. They cost $0.99 per bunch. 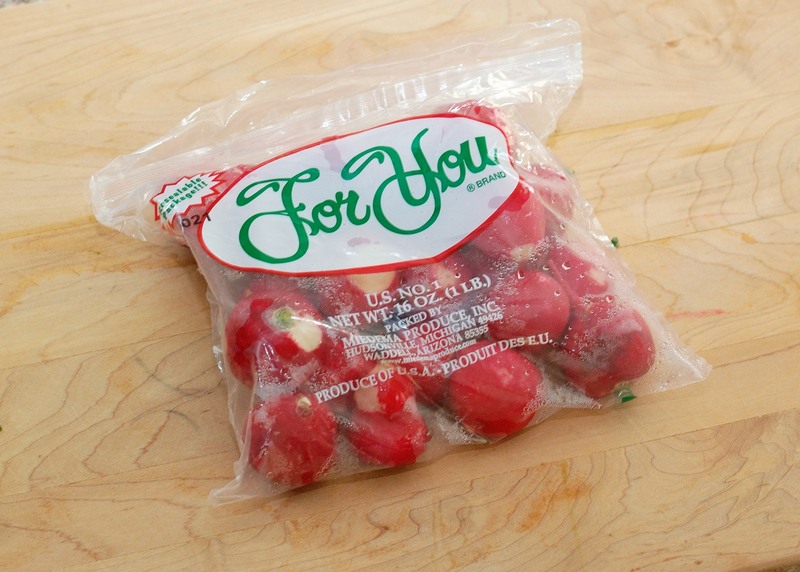 We purchased one bag of radishes, pictured below, from Hy-Vee at a cost of $1.99. 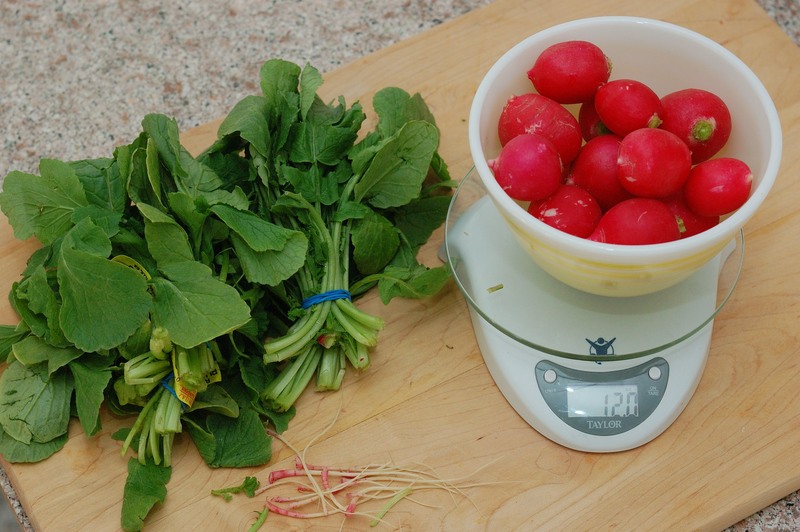 Now to weigh the radishes.We removed the leaves and roots from all radishes before weighing, but left them in the picture for comparison. 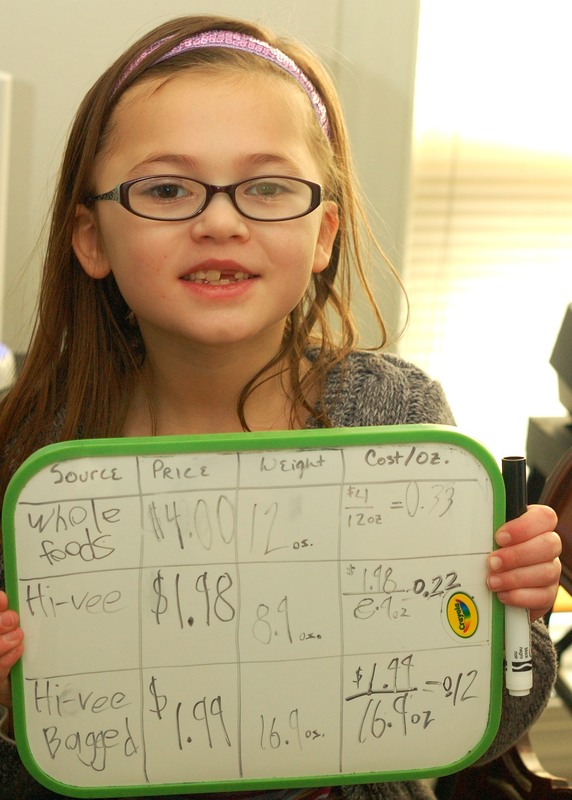 Her calculations showed that the Whole Foods bunched radishes were $0.33/oz., the Hy-Vee bunched radishes were $0.22/oz. 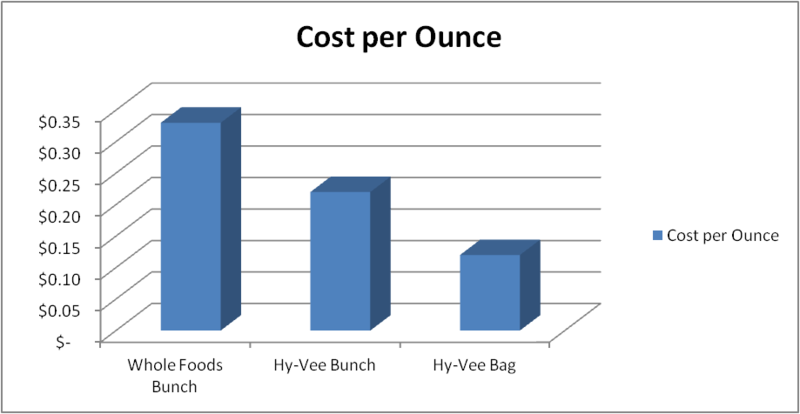 and the Hy-Vee bagged radishes were $0.12/oz. While we were working on her table, we talked about dividing dollars into cents and rounding to the nearest penny. 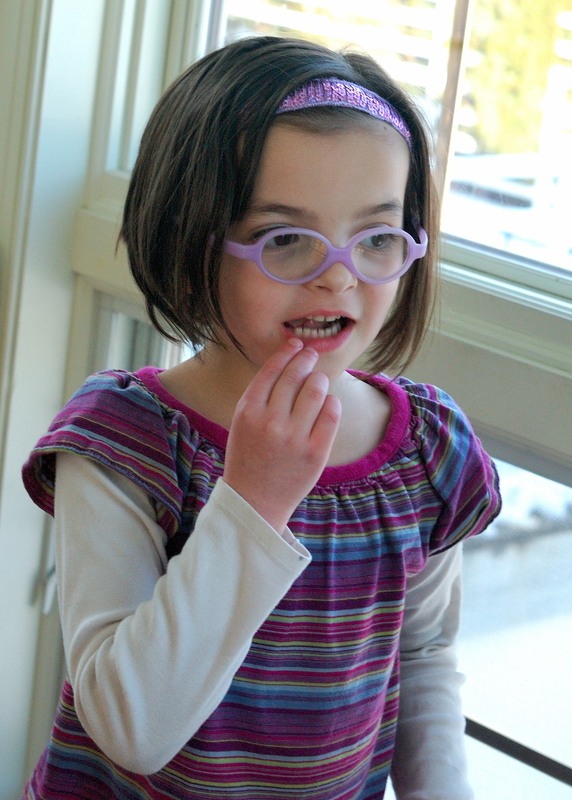 Lucie was frustrated that she could not divide a penny into thirds, but was able to understand why she could not. We compared the appearance of the radishes. The Whole Foods radishes were the prettiest, the Hy-Vee bagged radishes were the second most attractive and the Hy-Vee bunched radishes were the least attractive, but not bad. 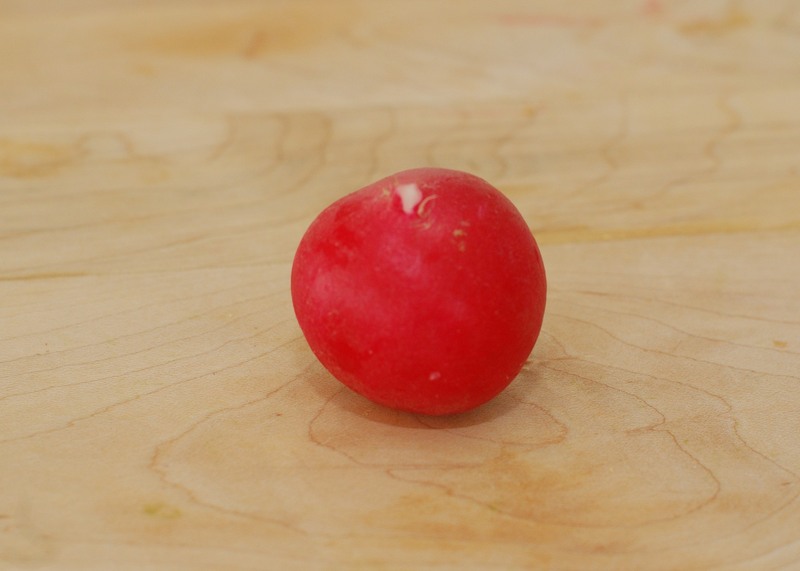 We found no difference when we compared the taste of the three types of radishes. I introduced her to Microsoft Excel and helped her make a table of the different radish attributes and a bar graph comparing price. I asked Lucie to decide, based on her radish data, which type of radishes she would choose to buy and why she would choose that type. 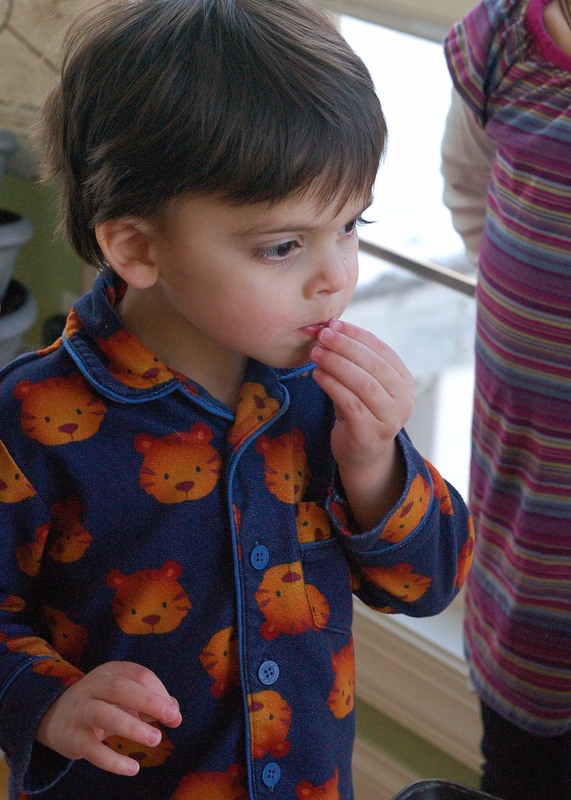 Theo was interested in watching Lucie’s radish analysis and kept running through the kitchen to steal radish snacks. Now, what were we going to do with all these radishes? Categories: Radish, Veggie Fun | Tags: k12.com, math, radish, vegetable | Permalink. I searched Pinterest. One of the recipes I found was for daikon radish cakes from Naturally Local. My kids love pancakes and potato pancakes, so this seemed like a reasonable thing to try. Except that they were made from a giant radish… I had my doubts. Serious doubts. Late this morning, I could put it off no longer. I prepared to shred the giant radish. 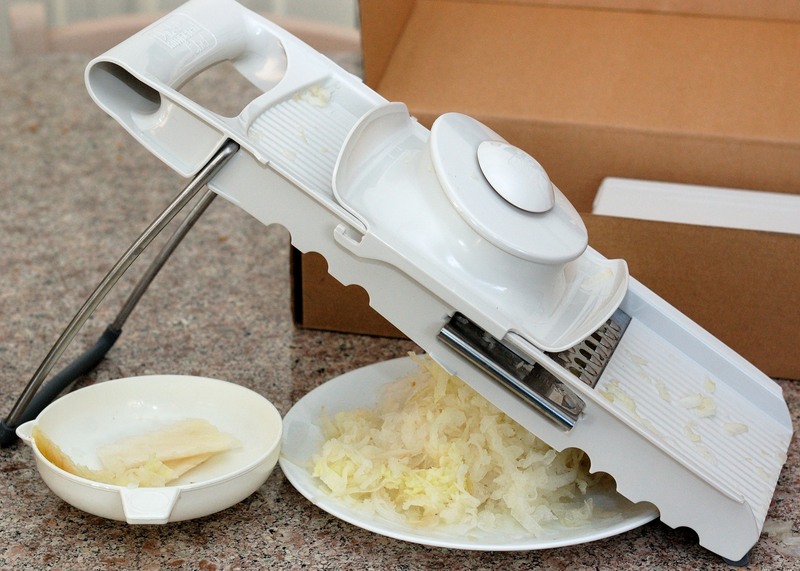 I considered using my Cuisinart food processor, but instead decided on the Pampered Chef Ultimate Mandoline . After scrubbing the giant radish, I cut the top off and cut it into sections that would fit on the shredder. Shred, shred, shred…. 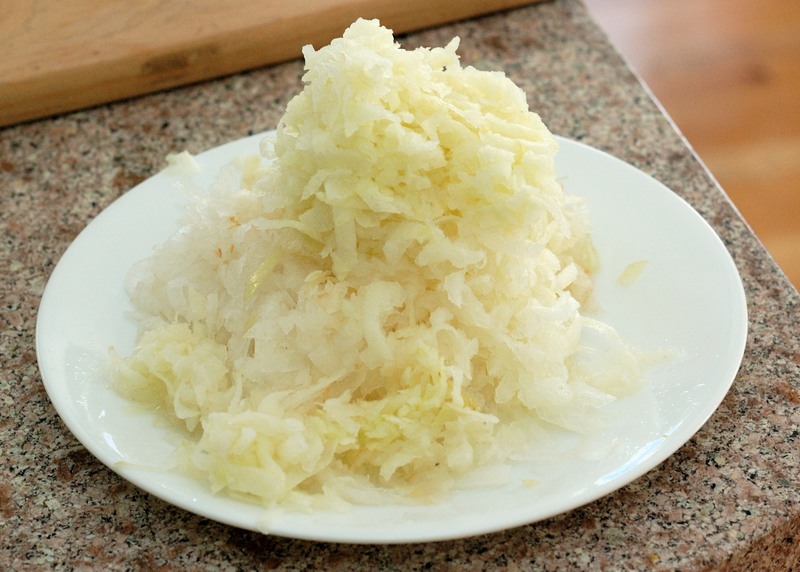 And we ended up with an odd smelling pile of shredded daikon radish. It was a whole lot watery, so we decided to squeeze out the liquid using a mesh strainer. 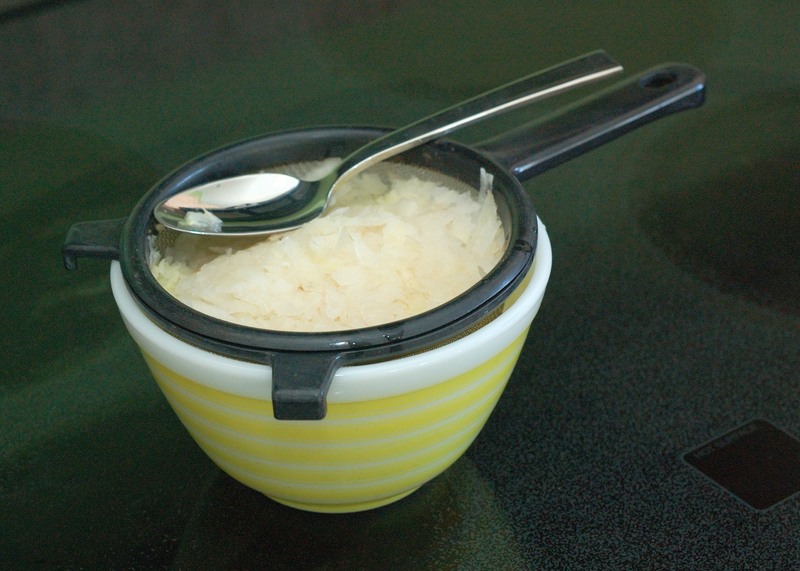 I would say that we ended up with one and a half to two cups of shredded radish. We added one beaten egg, 1/2 cup panko bread crumbs , 1/8 tsp. chili pepper, 1/4 tsp. garlic powder, 1/8 tsp. salt and 1/8 tsp. pepper to the shredded radish and mixed it well with a fork. I’m not going to lie. It looked a little weird and smelled even weirder. 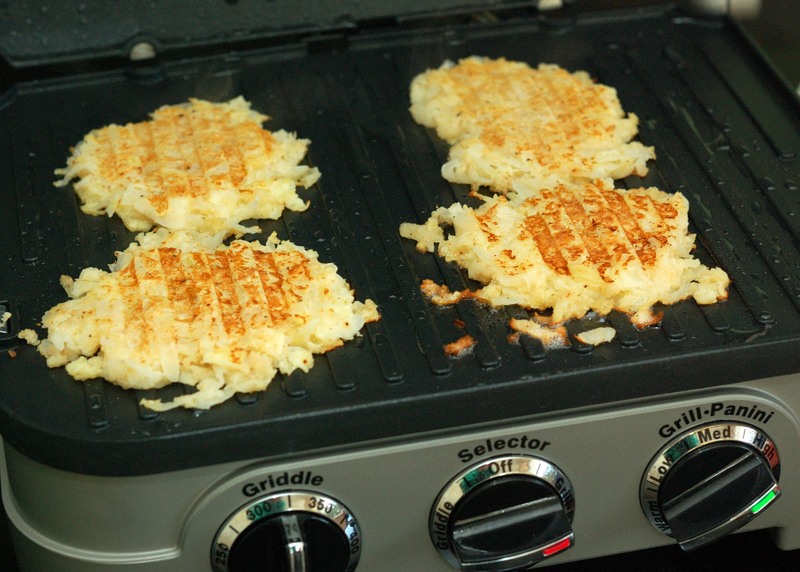 After brushing the grilling surface with a bit of peanut oil, we scooped the mixture into small piles on our Cuisinart Griddler , using the grill-panini setting on high heat and then closed the griddler lid for about five minutes, which gave us crispy, golden-brown radish cakes. They started to smell much better as they cooked. Instead of using a griddler or panini-press, you could also cook these in a skillet or on a pancake griddle, turning them with a spatula to make both sides crispy. The Naturally Local recipe suggested topping these cakes with sour cream and chives. I have a “no-sour-cream-on-anything-ever” policy, so we mixed some chopped chives into some softened butter and topped the cakes with that instead. They looked pretty appetizing. But how would they taste? Lucie loved them. She ate three! I had to talk her into saving two for Dave to try. He also liked them. I thought they were pretty good. My guess is that they would taste better fried in some bacon grease, but I would definitely make them again. They were similar to potato pancakes, with a slightly different flavor. 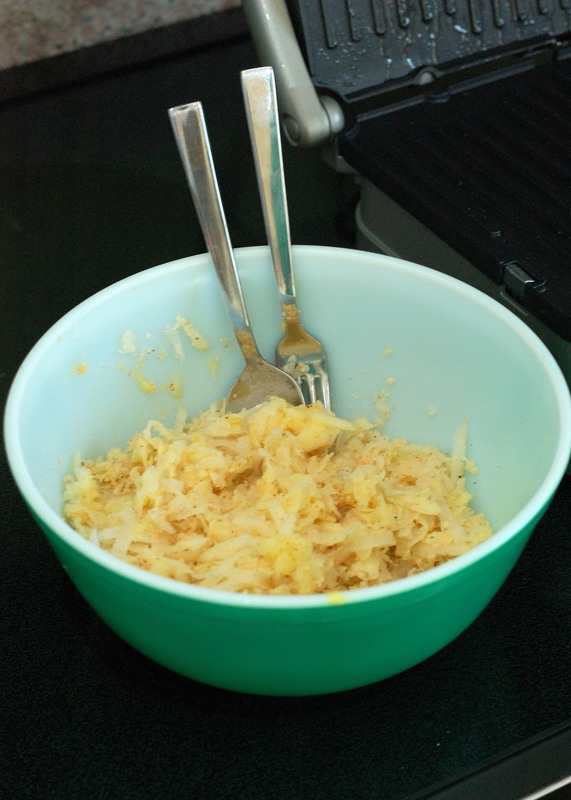 Shred the daikon radish with a food processor or mandoline. Remove excess water from shredded radish with a mesh strainer or by squeezing through cheesecloth or a clean kitchen towel. Add egg, panko bread crumbs, chili pepper, garlic powder, salt and pepper. Mix thoroughly and spoon mixture onto peanut oil coated griddler or skillet on high heat. Cook until both sides are crispy and golden-brown. Mix chives into softened butter. 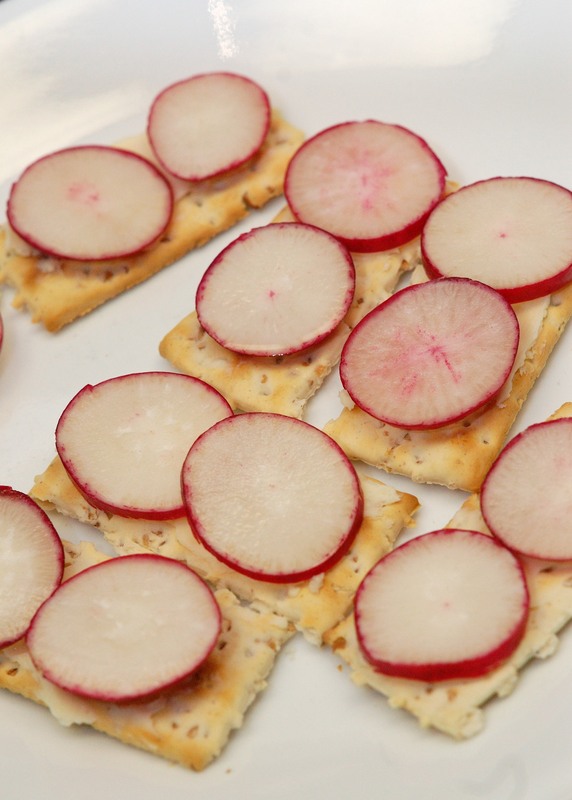 Use chive-butter mixture to top radish cakes. Makes 8-10 small cakes. Lucie and Dave also tried a few bites of the raw daikon radish. They said it had a mild initial taste with a peppery aftertaste. We have plans for at least one more radish recipe and a fun project or two before radish week is over. Stay tuned! Today I used the index in my veggie book to find information about radishes and daikon radish sprouts. I read a little bit about them while we were cooking. I enjoyed helping Mama in the kitchen today. I want to take cooking classes when I get older. 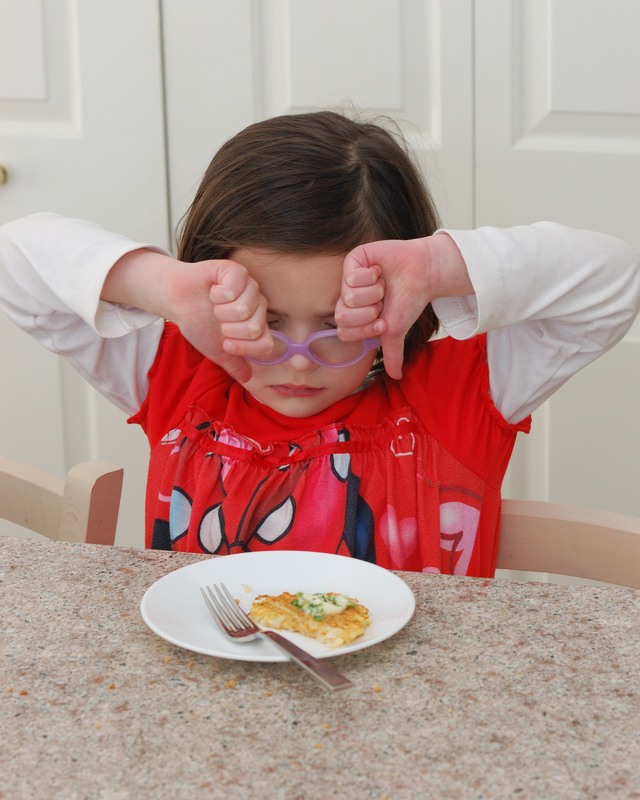 I give the radish pancakes two thumbs up and I would like to try them again. Categories: Radish | Tags: chives, daikon radish, radish, vegetable | Permalink. 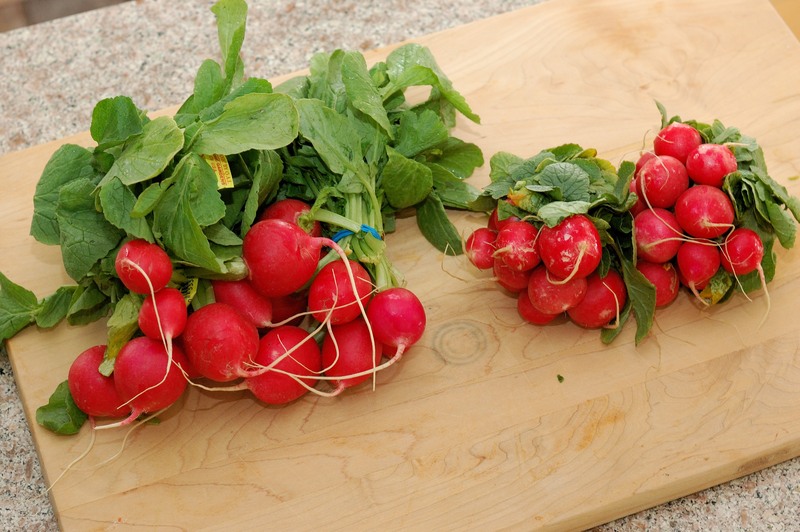 And our week four veggie is ……radishes!!! Lucie and I just returned from an afternoon of radish shopping. 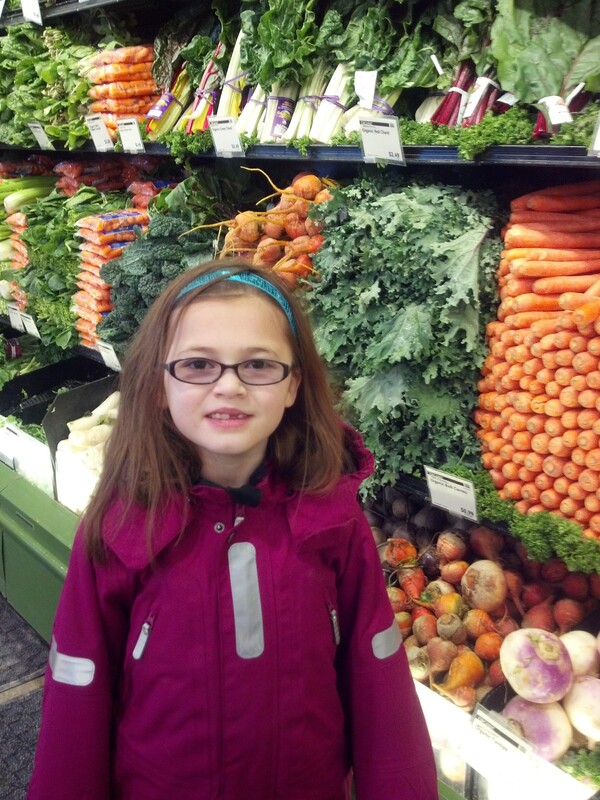 I think letting kids shop for veggies is an important way to get them interested in eating veggies. 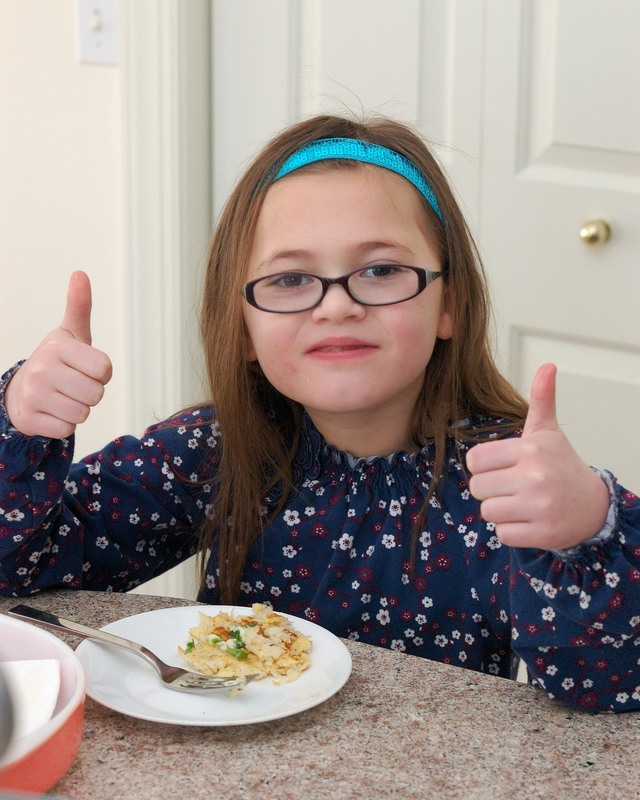 Lucie loves looking at all the unusual produce and planning what she would like to try in the future. Here she is admiring the variety of beets at Whole Foods. We did browse a few other veggies and, of course, the toy and electronics section at Target. 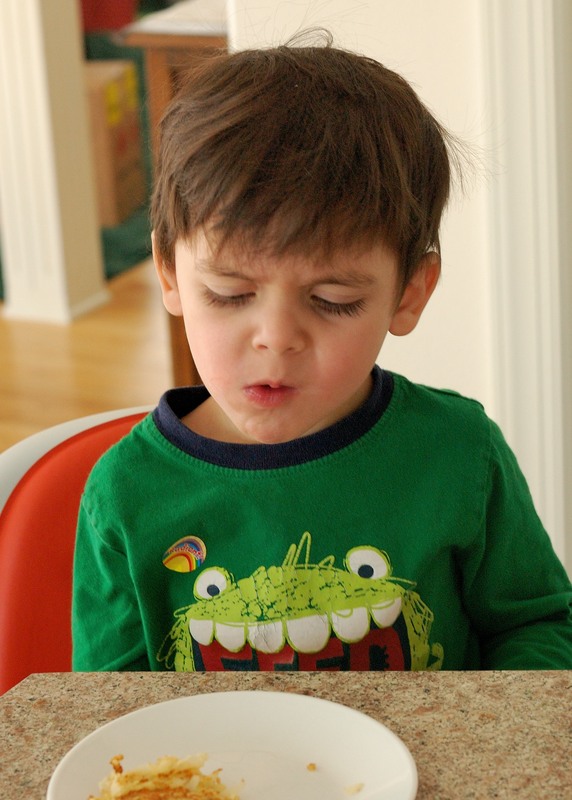 We checked out the radish supplies and prices at Whole Foods, Hy-Vee and Super Target. We were hoping to find the standard red radish that we know so well, as well as a few other varieties. Although we have seen the small white radishes at Whole Foods before, they did not have any today. 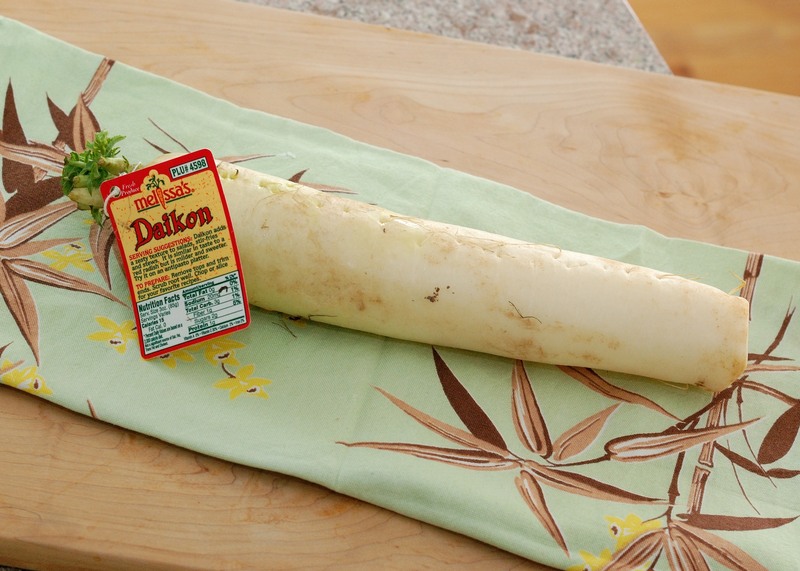 We found a very large, white radish variety called the daikon radish at Hy-Vee. We only purchased one, because we really did not know what we would do with it. When we got home, a quick search of Pinterest gave us lots of ideas. Did you know that there are varieties of the daikon radish that are planted for the purpose of drilling through the soil with their giant roots? These tillage radishes are planted in the late summer and allowed to grow until they are killed by cold weather. Their growing roots diminish soil compaction. They are killed by cold weather and then decompose over the winter, enhancing the nutrient content of the soil. One of the varieties I read about was called “Groundhog“, apparently for its excellent digging ability. One downside to this technique seems to be that the radishes get a bit stinky as they decompose in the field. I had never heard of tillage radishes before today. You can read more about it at TillageRadish.com. Does anyone have any experience with radishes used in this way? I’m curious about just how smelly this really is. Our radish recipes for today are as simple as can be. 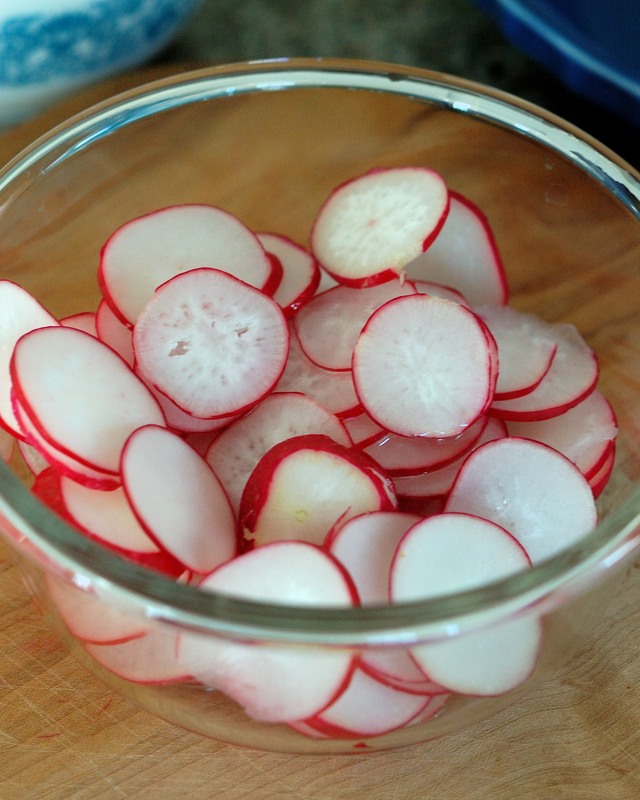 Recipe #1: Sliced radishes with salt. Slice radishes. Sprinkle salt on top of radish slices. Feed to three year old. Tell him they are chips. Watch them disappear. 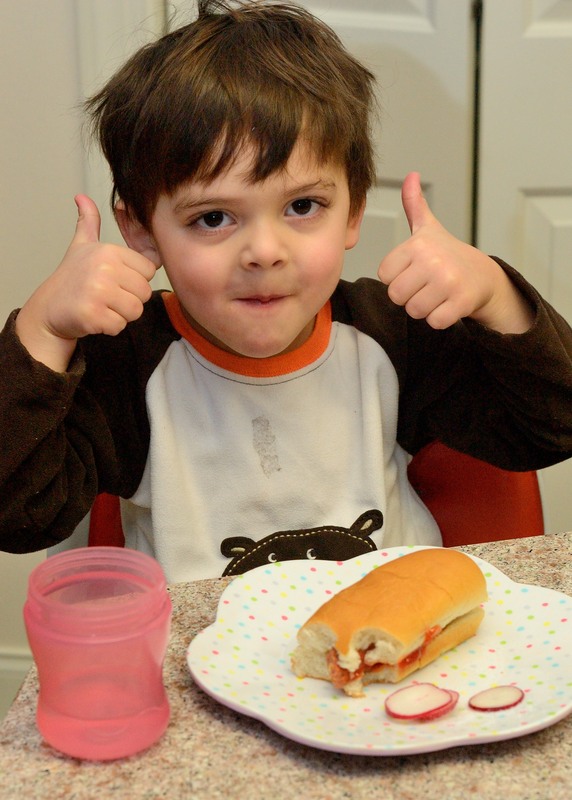 Theo gives this recipe two enthusiastic thumbs up. He ate a whole pile of them and asked for seconds. If you can, try to keep the three year old from eating a few of the sliced radishes from Recipe #1, so you can use them in this recipe. Butter some crackers. Place radish slices on top of butter. Sprinkle salt on top of radish slices. Delicious! This is a favorite snack of Lucie’s. She ate the whole plate full. 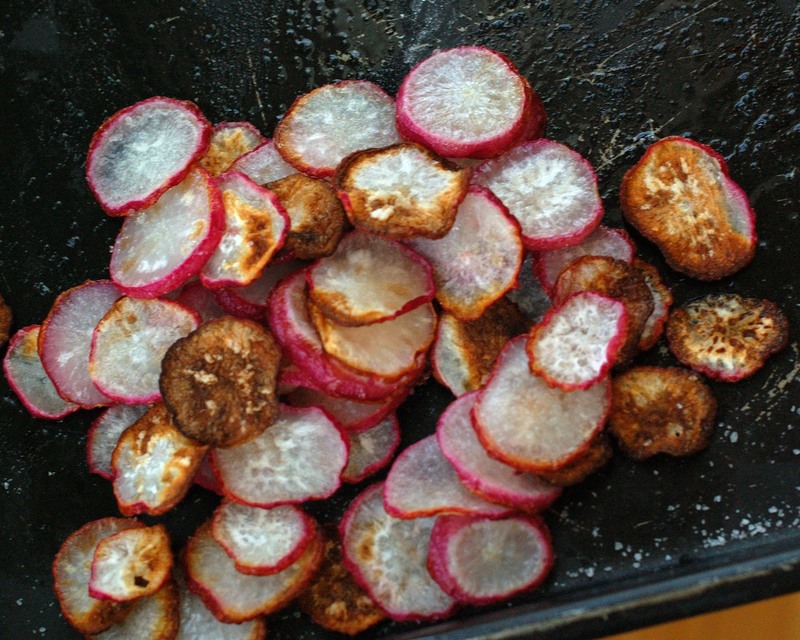 We are planning to try one of the recipes where you roast the radish chips later this week. 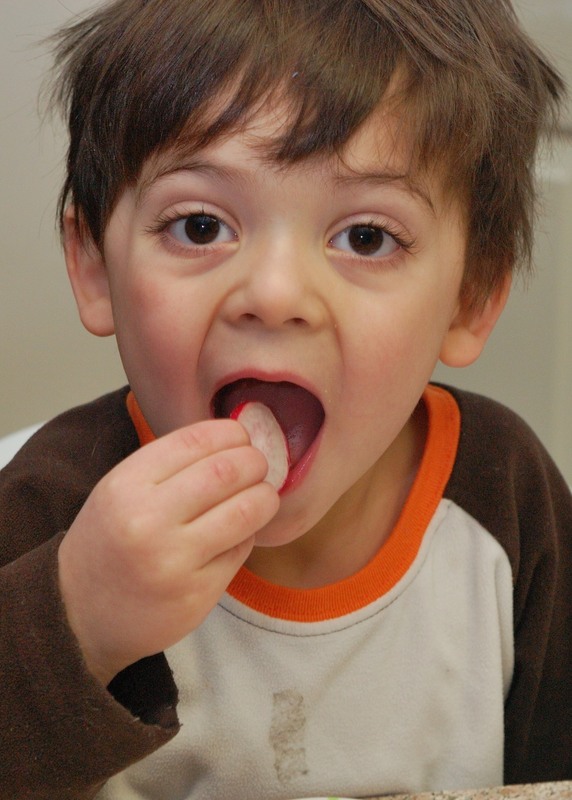 We ate radishes today. I like them best with crackers and butter. I am looking forward to cooking the big white radish that we got at the store today. We will show you a picture of it in our next post. Happy Groundhog Day! Categories: Radish | Tags: butter, daikon radish, radish, tillage radish | Permalink.